Fayetteville Mayor Lioneld Jordan speaks Tuesday while David Johnson (right), executive director of the Fayetteville Public Library, listens. Seated in the front row were Jim and Nancy Blair. The library is named after Blair, whose donation helped fund the original facility, which opened in 2004. A cheering crowd watched as a wall came tumbling down Tuesday at the old City Hospital in downtown Fayetteville. 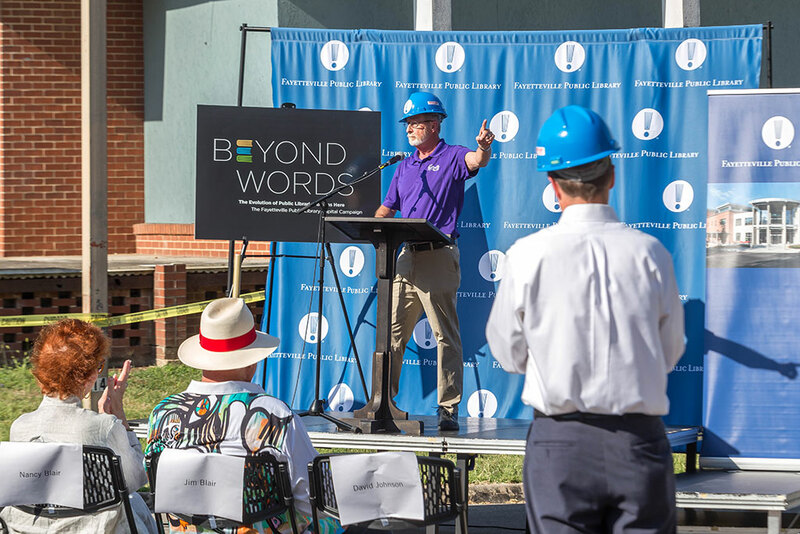 The event served as the first phase of the demolition of the former hospital building, and signaled the beginning of a 70,000-square-foot expansion of the Fayetteville Public Library. And while crowds typically gather for the demolition of a building, there was an added sense of delight at this particular event. Of course, it’s hard not to feel excitement after listening to the city’s most animated proponent. The City Hospital closed in 2012 after 100 years in downtown Fayetteville at the corner of Rock Street and School Avenue. After serving as a hospital for 81 years, it transitioned to a nursing home operated by Washington Regional Medical Center in 1993. 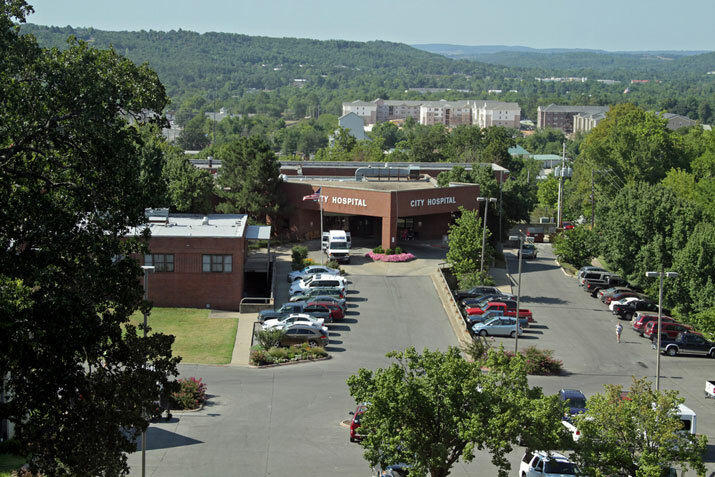 Jordan said he was so worked up Tuesday morning that his staff asked him if he was going to be OK.
Jordan dedicated his remarks to honoring the hospital, which he said had been a cornerstone of the Fayetteville community since 1912. “I’m thankful to the doctors, nurses, staff and caregivers that provided countless hours of love and support to thousands of patients over the years, and to the people who were born here – like myself – to those who received treatment here and to those who took their last breath here,” said Jordan, adding that his grandmother passed away in the hospital. 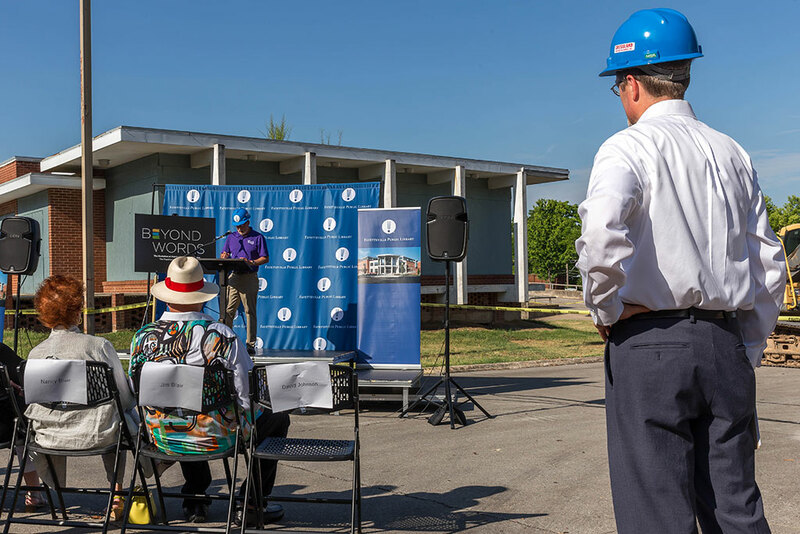 He said the property will continue to serve Fayetteville residents for generations to come, and will serve as a literal and figurative foundation for the expanded library. “Even the bricks and the concrete will be ground up and used in the foundation of this expansion,” he told the crowd. He called for a round of applause for those who worked on the campaign to pass the 2016 millage increase that will provide about $26.5 million for the project. Jordan said while he may not have much formal education, he’s always been a reader. Knowledge will change your life, Jordan said.